Cinecultist didn't want to overload our readers with Eternal Sunshine of the Spotless Mind postings, but we did see the film this past weekend after much build up. And we loved it, not to fear. All of the expectations were met and there were no lingering feelings of overrated buzz. But what to say now about said lovely, luminous, melancholy film that either hasn't been said by other critics or doesn't seem like general consensus retread? (Other than of course, "run don't walk to the theater to see it.") We knew all along that we would love it, and that was based on the preview. It made CC bop in our seat. It made us happy to be at the movies. We hadn't felt this elated watching a few minutes of edited footage since first seeing the trailers for Rushmore and Lost in Translation. Sometimes a film speaks to you bout how you feel about your universe, that seems to take a part of your imagination perhaps you weren't even consciously aware of and puts it on the screen. Eternal Sunshine is one of these kind of movies and we're not sure we can think of a more thrilling film going experience. 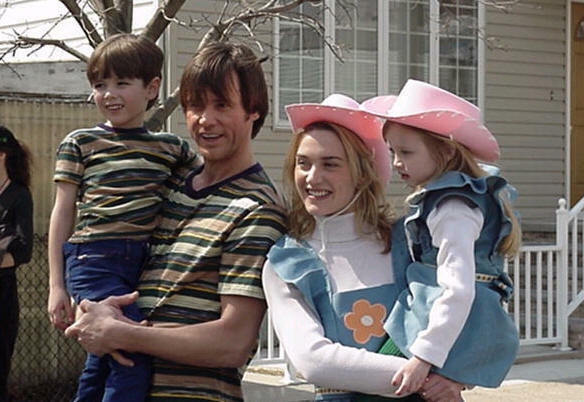 Below we offer a non-IMdB Eternal Sunshine photo harvested from the web for your viewing pleasure. Remainder: If you haven't been over to Daily Gusto in a while, you should check out their hot new redesign. And we're not just saying this as a former, and hopefully future, contributor -- Jennifer and Harry, the blogazine looks good on ya.